We have a garbage problem on our street. Specifically, the business at the end of our street has been using the location to collect garbage from a number of other “low rent/short term” rental properties and then eventually, have it picked up. But it is a real eyesore in addition to whatever health problems are potentially resident in the pile. No amount of calls to the city seemed to make any difference despite the number of municipal bylaws that were being broken. It is an odd neighbourhood; one in transition where the retail stores seem to do whatever comes to mind. Last year two restaurants simply decided to build outdoor patios without any permits. You practically have to walk on the street to get past one of them. So, back to the garbage. It takes a certain amount of persistence to finally connect with someone in authority at the municipality, at least with someone who cares. That’s where my IPhone comes into play. Each day I would walk Molly the Doodle past the garbage heap and take a photograph and instantly send it to the municipal bylaws officer. She would then make frequent visits to the location and started giving fines. 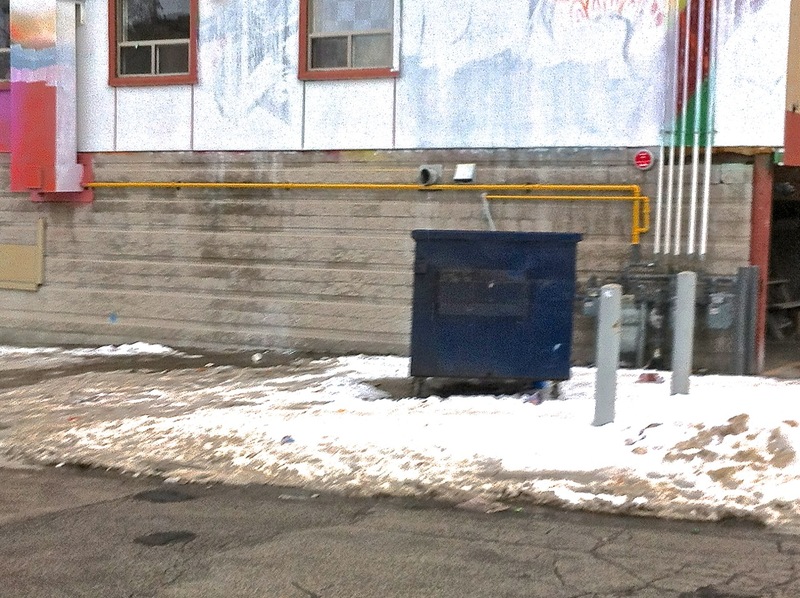 At one point, the location property manager claimed that the local residents were throwing their garbage into and around their bin. However, they have a clearly marked pickup truck that routinely brings garbage to the location and a photograph of this activity ended that conversation pretty quick. So on a recent walk over the Christmas break, it dawned on me that I haven’t seen any garbage there for some time. It seems to have worked. The persistence and the photographs. The “instant” sending of a photo and the response by the authorities. I can’t thank the bylaws officer enough as without the response to my photos, nothing would have changed. We ended up working as a team. I’m not sure that the problem won’t reappear at some time. Still, it seems to have worked. So, while the photographs are of garbage and exceptionally poor quality, they have made a statement all my early phone calls could not. Now, about those illegal patios. This entry was posted in Promotion, Street Photography and tagged Alley, community, Garbage, outdoor photography, photography, street photography, Toronto. Bookmark the permalink. These garbage pictures have a weird aesthetic appeal. Especially the second one. Thanks. I hadn’t thought about that. I like to do “projects” so perhaps something on garbage might be fun. I did one on back-alley graffiti so this could be a complementary piece. Yeah, I think that would be interesting. It’s a pretty unusual photography topic and you could probably have a lot of fun with it. Well done Gary~!! We have the same problem where I live….except that it is a townhome complex and the city government has nothing to do with it. The only realistic answer is to install costly gates at the front, but in this economy our budget does not allow for it. My wife and I live very close to the dumpster location and it is usually me that can’t take it anymore, so I put on my gloves and go out and deal with it. Thanks. I feel for you. I learned a few things about bylaws in the process. You have to complain to get action. If you are persistent, the authorities will come around. Garbage cannot be on public property (it was) and must be covered or put behind an enclosure (it wasn’t). Also, they constructed the concrete pillars on public property without permission. 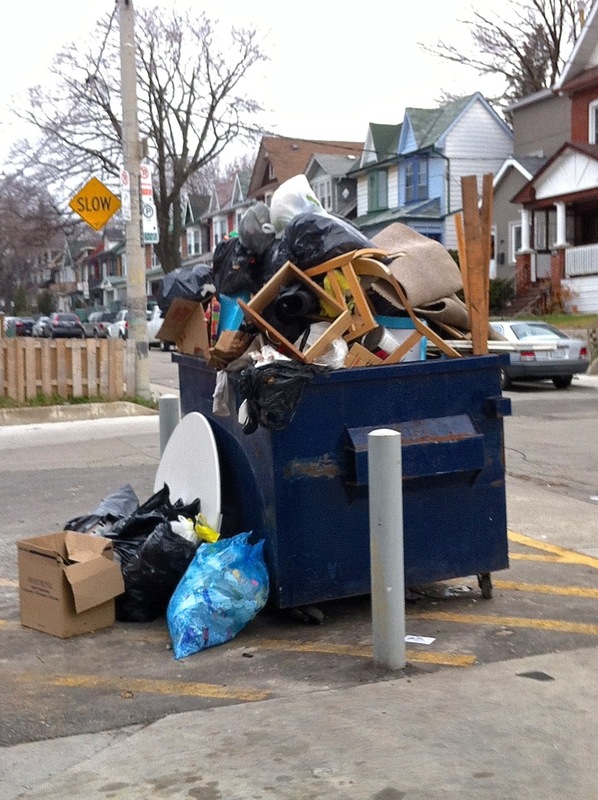 You may want to look into any bylaws or governance around garbage in your specific circumstance to see if there is something to hang your hat on. We had a number of them. These are cool photos. I have an artist friend who did a painting of trash.. it was quite beautiful, even if it was garbage. 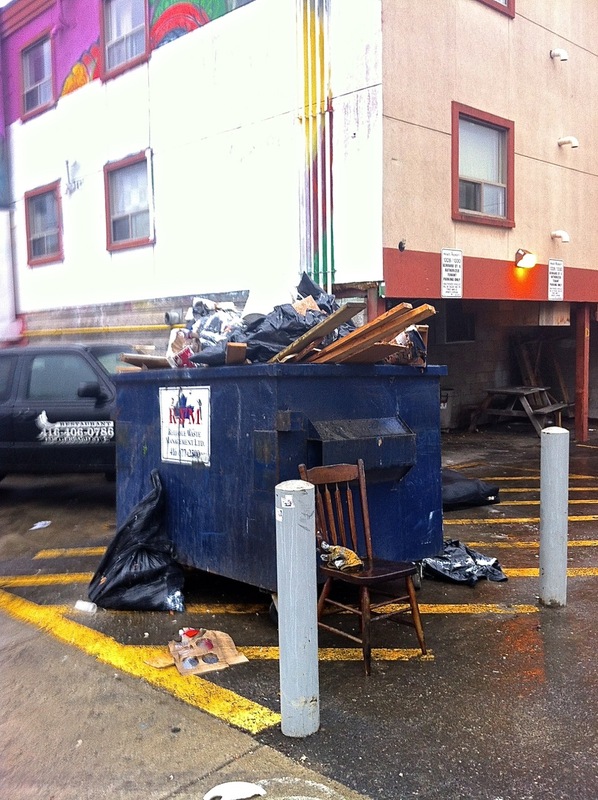 It was titled “One mans junk”… It had some bins, old broken chairs with other items strewn on the top…On the practical side, tech is so good for many things.. Way to go you on both counts! Thanks. It’s given me an idea for a little garbage project still unclear in my head, but coming together.